9/2/11 11am To All ?This was supposed to be the happy message where I sent you the link to our recent Alaska Trip. Then you could oooh and ahhh over the pictures of the bears, the moose, and of course, all those fish that you’ve all come to love. 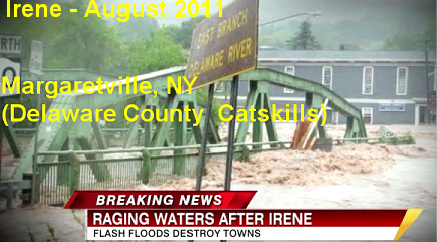 But 3 days after we returned from AK, Hurricane IRENE hit the East Coast. 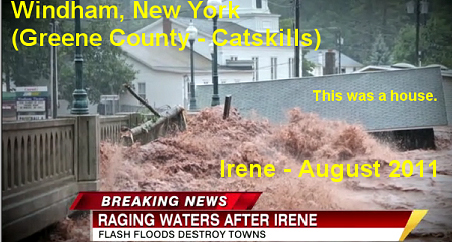 While many of us think of it as a non-event, our beloved NY Catskill Region was crushed by it. Fortunately our house in Shandaken, built in 1924, by my grandfather Tom Meredith, was spared, but the damage to the 30mi area around us is epic. It is so much worse than any previous floods that it is hard to imagine how more lives were not lost. Still, the damage on the ground to all the towns like Margaretville, Prattsville, Windam, Oliveria and Phoenicia, just to mention a few, is like nothing I have ever seen. As one of the local residents said this morning on the Watershed Blog: “Many people are wondering what to donate. Just imagine 8 feet of water, silt, muck and mire going through your living room, bedrooms, kitchen and bath rooms. How would you clean it? What would you need? Our mattresses are shot, we have no clothes or shoes, and all blankets are gone. But wait, now I have to worry about black mold setting in. Get the idea?? Power in many areas will not be restored for weeks. This is because not only are the electric lines down, but the ground where the poles used to go has been washed away in many places, requiring the lines to be re-routed. This is a massive challenge for the utility workers and will surely delay the work. The current estimate to restore power to the town of Phoenicia, just 4 miles east of us, is 2 weeks. Shandaken power is targeted to be restored by late 9/7. Amazing, we now have power. Still, many other towns are without it. Please help by donating to any of the groups listed here. 9/6 The C30 RR Bridge just above the Askokan Reservoir is also mostly gone. 9/5 NYTIMES-On Flood Plain, Pondering Wisdom of Rebuilding Anew"...Recent studies have asserted that the region’s weather is getting more severe, including heavier rainfall and more frequent and intense flooding. The last three large flooding emergencies ?in 1996 and 2005, and the disaster of recent days ?were all considered 100-year floods, meaning that they had breached a level that had only a 1 percent chance of being exceeded in any given year." 9/3 5:34p "I can't speak for Woodland Valley proper, but power is on in Phoenicia, and was on the Garfield/Herdman Rd. area as of about 1pm yesterday"
9/3 4:58p Statement from Margaretville Mayor Bill Stanton The Village of Margaretville is reviewing information and is monitoring the situation regarding the block on the south side of Main Street and to the east of the traffic light. The buildings appear to be stable at this point, but remain unsafe to occupy in any way. No decisions have been made regarding possible demolition. 9/3 12:59p Area Emergency officials are asking you to PLEASE STAY OUT OF Margaretville, Arkville, and Fleischmanns via Rt. 28. The one lane closure through Arkville is creating a serious traffic issue. Also... if you are donating items to relief efforts, M'ville is full up on clothes. They are asking for food and cleaning supplies only. If you are donating canned good, PLEASE INCLUDE A CAN OPENER with every donation. 9/3 12;35p In addition to cash, Phoenicia Command Center (The FD on 214) needs UNopened Cleaning Supplies…Also, nice plastic storage bins for people to stow their few belongings? Money is critical at this point. They have tons of clothes, which require a lot of work to sort, etc. Homemade Food is needed to feed the National Guard at the Command Center, as well as bottled water and Gatorade. 9/3 7:54a Several Margaretville businesses are open this weekend. You can get to Main St. across the bridge on Fair St. Now is the time to support local businesses, which have been barely hanging on in this tough economy. 9/2 10:06a Watershed Post: "We are telling second homeowners at this point to use their own judgement, stay safe, be calm, gas up before you come. We're not getting much info on that front from officials, and what we are getting is fast-changing and conflicting." Middletown, Roxbury and Fleischmanns - via The MARK Project - Send a check made out to The Mark Project, PO Box 516 Arkville, New York 12406, 845 586 3500 You should say that your donation is for Hurricane Flood Relief and if they wish to specify which village they want the money to go to. There are many people who need our help. Every penny counts! Even if you can send a dollar, it is much appreciated.